Interest in acceptance and commitment therapy (ACT) is expanding rapidly. Many of those who are interested in ACT are trained using a mechanistic cognitive behavioral therapy model (or MCBT). Utilizing both ACT and MCBT together can be difficult, because the approaches make different philosophical assumptions and have different theoretical models. 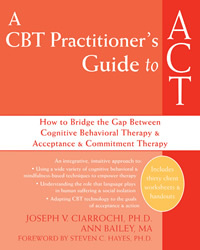 The core purpose of the book is to help provide a bridge between ACT and MCBT. The emphasis of this book will be applied psychology, but it will also have important theoretical implications. The book will highlight where ACT and MCBT differ in their predictions, and will suggest directions for future research. It will be grounded in current research and will make clear to the reader what is known and what has yet to be tested. The core theme of A CBT-Practitioner's Guide to ACT is that ACT and CBT can be unified if they share the same philosophical underpinnings (functional contextualism) and theoretical orientation (relational frame theory, or RFT). Thus, from a CBT practitioner's perspective, the mechanistic philosophical core of MCBT can be dropped, and the mechanistic information processing theory of CBT can be held lightly and ignored in contexts where it is not useful. From an ACT practitioner's perspective, the decades of CBT research on cognitive schema and dysfunctional beliefs provides useful information about how clients might be cognitively fused and how this fusion might be undermined. The core premise of the book is that CBT and ACT can be beneficially integrated, provided both are approached from a similar philosophical and theoretical framework. The authors acknowledge that practitioners often have little interest in extended discussions of philosophy and theory. Thus, their discussion of functional contextualism and RFT is grounded clearly in clinical practice. They talk about what functional contextualism means for the practitioner in the room, with a particular client. They describe how RFT can help the practitioner to understand the barriers to effective client action.